Nail art has been around forever—and what mum doesn’t love the brief pleasure of being treated to a manicure—but would you have your baby’s ultrasound pasted onto your fingers as part of the deal? 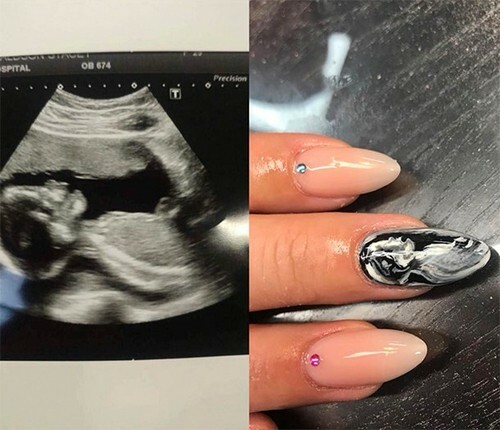 ‘Baby scan nails’ are going viral, thanks to Sarah, a beautician from Stockon-on-Tees in the North East of England. Online mummy chat groups are agog at this weird ‘n’ wonderful acrylic nail design—probably more because of its outlandishness than actual aesthetic appeal. In any case, the art remains impressive—Sarah replicates clients’ ultrasounds by hand-painting it onto false nails. To date, Sarah’s first go at the design, which she snapped and posted on Facebook, has been shared 145,000 times. Now, even international hopeful clients are clamouring to get a spot on the baby scan mani waiting list. The response to the quirky nail art has been mostly positive, with Sarah saying she’s fine with the few naysayers calling it ‘creepy’. After all, if art appreciation is subjective, nail art surely is, too.